Alex is a geology student at California University of Pennsylvania who is interning with The Center for the spring semester. Last week, she went on CCJ’s “Fracking and the Coalfields” tour with Executive Director Veronica Coptis. Below are her reflections on the experience. We were standing in Enon Cemetery on a snowy, overcast morning. 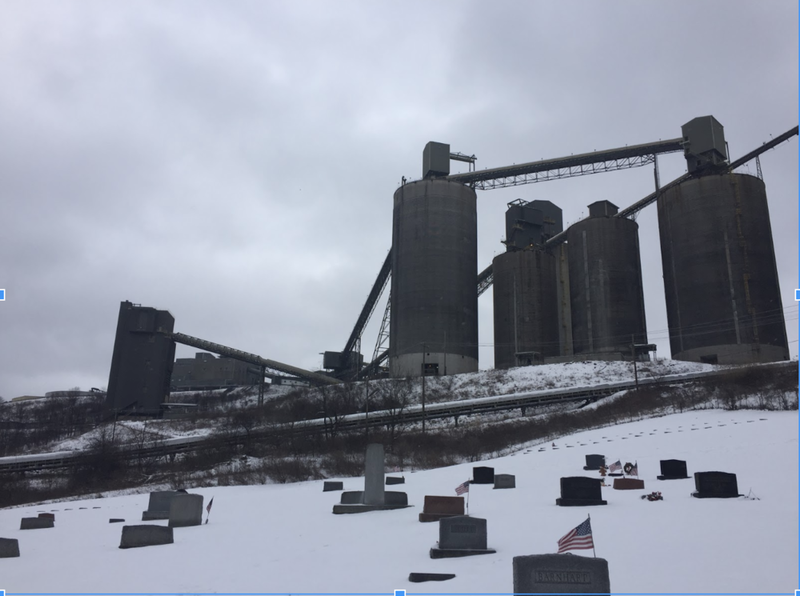 There amongst the gravestones and coal, I listened to Veronica tell the story of the Bailey Mine Complex that loomed over us with its twinkling lights and industrial clatter. As the largest underground mining operation in North America, the Pennsylvania Mining Complex (Bailey, Harvey and Enlow Fork) longwall mining operation is just about the size of Manhattan, but underfoot. We discussed “clean coal”, which, spoiler alert, doesn’t exist, and how intertwined southwestern PA’s people and politics are with the coal industry. Over the course of the afternoon, we navigated through Greene and Washington counties, following well traffic all over rural southwestern Pennsylvania. Looking out the window were signs that directed the different energy corporations down the winding, crumbling, nearly single lane country roads to their respective well pads. If you weren’t in the direct path of a brine or water truck though, you could look in almost any direction and see the familiar shape of a drilling rig in the distance. We visited valley fills with their earthen dams holding back surface mining refuse, on the hillsides stark gaps in the trees where pipelines were constructed. I can’t imagine that most of the residents within these counties could have envisioned the long term effects that mining or the shale gas boom would have on the infrastructure, air quality or the landscape in their towns, let alone the not too distant future environmental impacts. As a geology student, resource extraction and the positive and negative impacts associated with them is something that’s discussed pretty regularly, though it’s not quite the same as visiting an area that has truly been affected by it. As we hit one of our last stops, Ryerson Station State Park, Veronica talked about the emotional ties that she and many others in the area have with the park and the grief they experienced after the loss of Duke Lake. If you’re not familiar with the story of Duke Lake, in 2004 the 62-acre lake needed an emergency drawdown after cracks occurred in the dam as a result of subsidence from longwall mining operations. Duke Lake had been a hub of activity for many residents who enjoyed fishing there during the summer. After the tour, I tried to imagine what it would be like to look out my window or drive down the road and every day encounter all of these impacts and not feel totally despondent. Or perhaps even worse, not realize the full impact on my health or environment because it’s all I’ve ever known. It’s not by chance that this type of development occurs here, and the fact that this area is abundant in resources isn’t the only reason. The areas where extraction is occurring most are often areas of poverty, without access to educational resources to make the decisions at hand or the legal resources/support to make them aware of their rights or defend them when necessary. Going on the tour gave me a personal insight to the issues that are the norm in Washington and Greene County. If you have the opportunity to chat with a CCJ team member or request a tour, I would strongly recommend doing so. This week, the Office of Representative Alexandria Ocasio-Cortez released the “Green New Deal Resolution.” The resolution outlines the goals, motivations, and responsibilities of the Green New Deal: a call for a collective effort to respond to climate change in a way that takes into account the economic, environmental, and social justice implications of changing climate conditions. Living in the coalfields, we all know that a plan to fight climate change won’t work unless it takes into account the needs of those most at risk - those who live with the everyday impact of pollution, environmental degradation, or resource extraction. We live in a place where our environmental concerns are inseparable from our economic concerns. 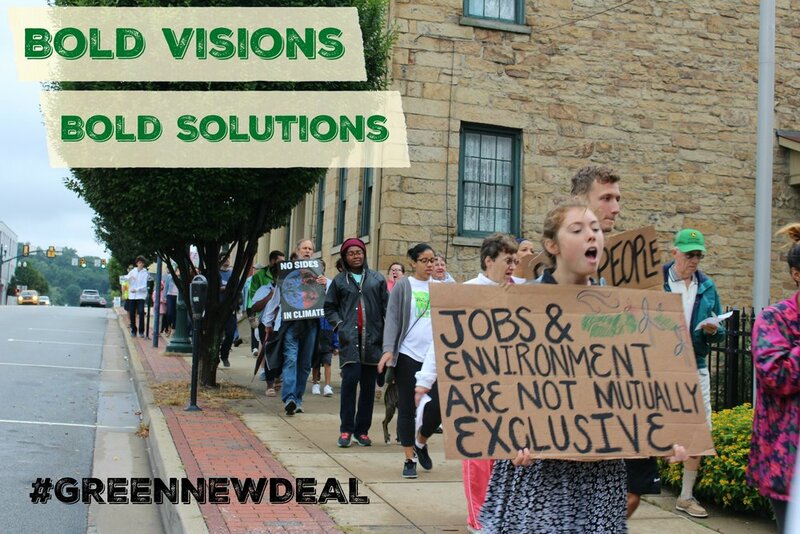 The Green New Deal resolution has evolved over time to be more inclusive of communities like ours - and we support its language about fair transitions for our workers, diversifying our economy, and giving power to frontline communities. We want to draw attention to a few of the Green New Deal’s resolutions and goals that make us particularly hopeful about the potential of this. We are excited to envision a future where our government is accountable to these principles. For those of us living on the frontlines of fossil fuel extraction, climate/environmental justice is inseparable from economic justice. If we consider energy, we must also consider the people involved in and affected by the energy industry; if we want to build resilience to environmental change, we must also build a diverse and resilient economy. The New Green Deal strives to address both climate change and economic inequality. Through this, it gives our community hope for a better future. Contact us if you want to discuss this in more detail. Give us your feedback for a chance to win a prize! We all filled out the survey! Will you? The team at the Center for Coalfield Justice is excited to announce that we will be holding quarterly meetings for our members and supporters! (Our first one is March 21st) You are the center of our work; without you, we wouldn’t exist. This year we want to engage more directly in person with you. Please fill out the survey below to guide our planning for these quarterly meetings and help us to have a better understanding of how you may want to get involved. There are so many fun and exciting things we could do! Mimi Wahid is an intern from MIT working with The Center for the month of January. Last week, she went on CCJ’s “Fracking and the Coalfields” tour with Executive Director Veronica Coptis. Below are her reflections on the experience. Coalfields Tour Reflection: What does it mean to be undermined? As an intern at the Center for Coalfield Justice, I’ve heard a lot about undermining these past few weeks. I’ve been told about what happens when creeks and streams are undermined: sometimes the creekbed fractures, the water drains, the groundwater systems are affected. Something geologically permanent can disappear overnight. I’ve seen images and videos about what happens when a building is undermined: the foundation cracks, walls can shift, properties are abandoned. Something formerly sturdy can become unsafe. I’ve started to understand what the economic and environmental impacts of undermining—meaning, mining underneath structures and water sources—are. But on the tour of the coalfields I took last week, I saw what it looks like when an entire community is undermined: when a community’s power is weakened, when their strength is removed from underneath them like a seam of profit-producing coal, when respect, trust, and security are piped away like wet natural gas. I rode in the front seat of Veronica’s car and listened as she told stories of the region. As we drove through Greene County, Veronica pointed to her right at a valley she used to play in with her siblings. She told us about how, in what felt like an overnight transformation, her favorite place to recreate on turned into a coal refuse disposal area. Sudden and dramatic transformations of land were present all throughout the tour. New roads cut through previously forested hillsides to accommodate heavy truck traffic. Valleys transformed into toxic hills as they were filled in with coal refuse. 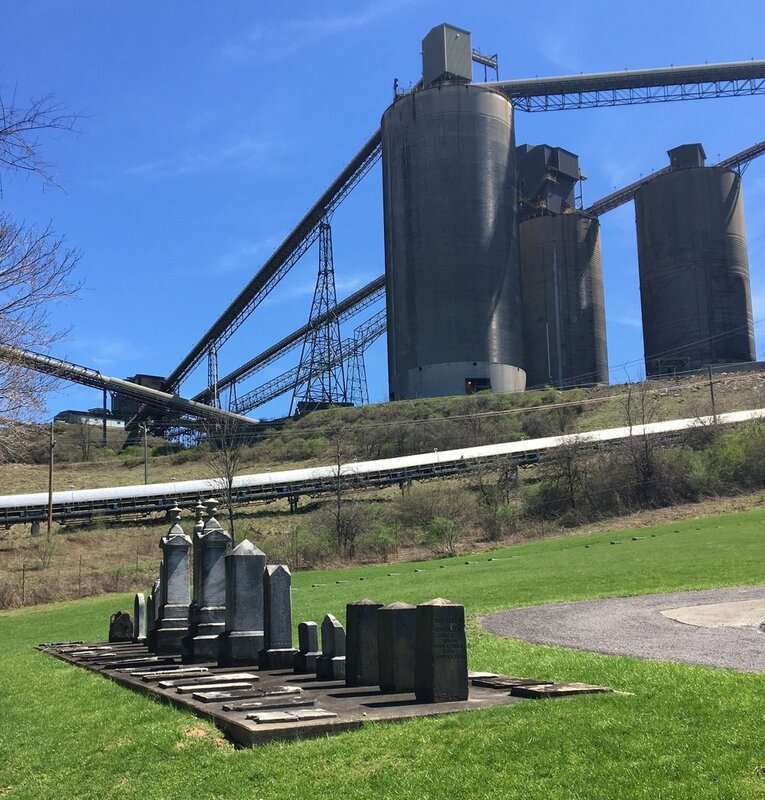 Our tour began at the Bailey Mine Complex coal preparation plant, where our attention was directed to the massive silos that store coal. Across the horizon, Veronica gestured towards two fracking well pads that, apparently, didn’t exist a few years ago. She explained that, before the wells were built, she used to point out this view as an example of the beautiful, undisturbed forests that CCJ fights to protect. In just a few years, the tour stop transformed from a message of hope to an example of the presence and power of the extraction industry. While on the tour, I tried to imagine what it would feel like to watch the landscape around me transform; to see strips of trees clearcut to make way for pipelines, valleys filled with toxic refuse, and skies cluttered with towering cranes. I wondered how this might affect my sense of security in my home and on my land. I imagined that it would be difficult to feel powerful if I couldn’t predict or influence the changes in the air I breathe, the earth beneath my home, the water sources I drink from. On the tour, Veronica told us about the various resources, like coal and natural gas, that are extracted from Washington and Greene counties. But the tour also made me wonder about the intangible things that have been extracted: it seemed as though residents’ rights to clean water, sense of security on their land, and confidence in the region’s economic future had been removed as well. It made me wonder if there even exists a fair compensation for extraction of this scale and kind. Going on CCJ’s “Fracking and the Coalfields” tour made me think more critically about what it means to be undermined. The tour showed me the effects of longwall mine activity through visible changes, like the empty bed of Duke Lake and the boarded up farmhouses that lined our drive. But it also showed me examples of undermining in another sense: places where the extraction industry has subverted, weakened, and removed power from residents. It reminded me of the importance of building and retaining power in communities affected by extraction. And it gave me deep respect for those with the strength to envision a different, more just, future for the coalfields. 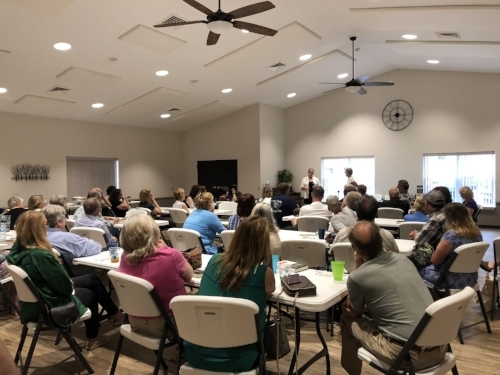 The Center for Coalfield Justice along with friends from the Buffalo Creek Watershed Association held an “Undermining for Residents Workshop” at the Donegal Township Municipal Building in the evening on Wednesday 14, 2018 and nearly forty (40) people attend. Tunnel Ridge LLC has been permitted to longwall mine a swath of coal underneath an area of West Alexander, and residents are concerned about what may happen to their water supplies and structures, such as their houses and farm buildings, after being undermined. CCJ’s staff attorney Sarah Winner helped describe steps for residents to take that can help them protect their water sources and structures on their property. Community members were engaged, asked questions and talked amongst themselves in hopes to better understand what the potential impacts of being undermined are and how they can ensure that Tunnel Ridge LLC is held responsible for any post-mining damages to their property and water supplies due to ground subsidence, which is the caving in of the ground after the coal seam is removed. If you have any questions or would like any information regarding the Tunnel Ridge longwall mine expansion into West Finley and Donegal Townships, please contact Nick at the Center for Coalfield Justice at nick@coalfieldjustice.org or 724-229-3550 extension 104. The Buffalo Creek Watershed Association can also be contacted at info@buffalocreekwatershed.org. Greene County’s current comprehensive plan will expire in 2020 and the county is in the process of updating it’s comprehensive plan. A Comprehensive plan serves as a document designed to guide the future actions of a community. It presents a vision for the future, with long-range goals and objectives for all activity that affect the local government. Comprehensive plans are critical documents for local government to access funding sources to support the vision of the region. The county is currently in the planning process and an advisory committee of the Greene County Planning Commission is working to draft the new comprehensive plan. The 50 member advisory committee has been meeting since March to develop the plan that will help define what the county hopes to accomplish over the next 10 years in terms of community and economic development. The advisory team is hosting a series of open house-type public meetings to share about the process and get input from residents on what should be included in the draft plan. This is your opportunity early in the process to share whether you are concerned about an increase in development in your rural community, a need to have increased access to broadband and cell service, diversifying employment opportunities, or any other visions, hopes you want to see the county work towards. This is the beginning of the process to get public input on the comprehensive plan and once the draft plan is complete the county will notice a 45 day public period and potentially a public hearing. If you need assistance getting to any of these meetings or want to make sure concerns are raised in your absence please contact Veronica at veronica@coalfieldjustice.org or call 724-229-3550. CCJ will have a team member at all meetings. If you want more information on the comprehensive planning process you can contact James Protin Jr with Mackin Engineering Company at jprotin@mackinengineering.com. 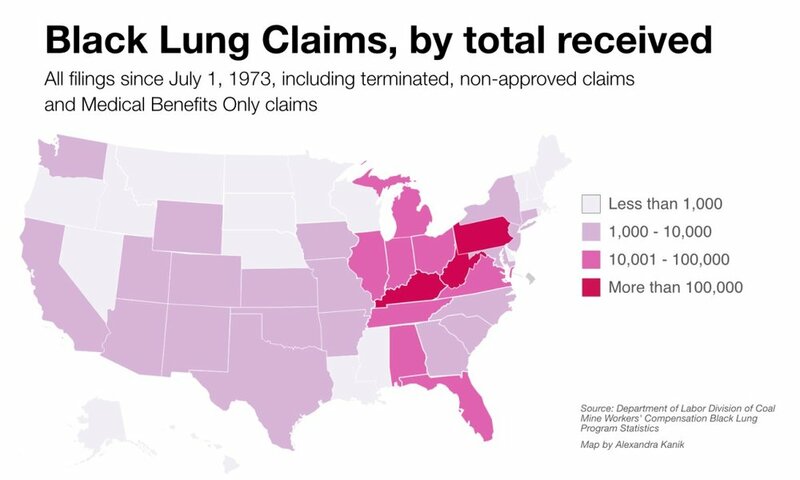 The Black Lung Disability Trust Fund has been around for about forty years, providing benefits to miners and, in some cases, to their surviving dependents to help them recover from the increasingly prevalent and powerful disease pneumoconiosis. “Black Lung Disease” was coined as a term because of the way the dust buildup inside the lungs can make them appear black. The Disability Fund has been in financial jeopardy for years, with expenditures consistently exceeding revenue, but the situation is about to become worse in 2019 when the excise tax that resources the Fund is set to decrease by 55% despite the fact that more than 25,000 people rely on its benefits as of 2017. Recently the cases of Black Lund have been increasing. Funding for the Fund comes from the Black Lung Benefits Revenue Act of 1977, which assesses a tax on operators per ton of coal mined. Not all miners are eligible for benefits: some operators cover expenses related to the disease, but others do not, and some operators are no longer is existence, leaving their former miners with bills to pay on their own. This is where the Fund kicks in. According to a report by the Government Accountability Office (GAO),”The current tax rates are $1.10 per ton of underground-mined coal and $0.55 per ton of surface-mined coal, up to 4.4 percent of the sales price. Therefore, if a ton of underground-mined coal is sold for less than $25, than the tax paid would be less than $1.10. For instance, if a ton of underground-mined coal sold for $20, than it would be taxed at 4.4 percent of the sales price, or $0.88” In some years, though, this income has covered less than 40% of the cost of the program, forcing it to borrow money from other funds, creating debt and resulting interest payments that take up even bigger chunks of its budget. The same report by the GAO outlines various scenarios that would help maintain the Fund, ensuring that eligible miners who need its support are able to receive benefits. The proposal the Center for Coalfield Justice and our allies through the Alliance for Appalachia would support is an increase in the excise tax levied on mined coal by 25%. This increase would add $0.27 to the tax on underground-mined coal - literally spare change. The Alliance for Appalachia is planning a trip to Washington DC in September to speak with senators and representatives from Kentucky to Pennsylvania, raising awareness and advocating for policies that would keep the Fund intact. 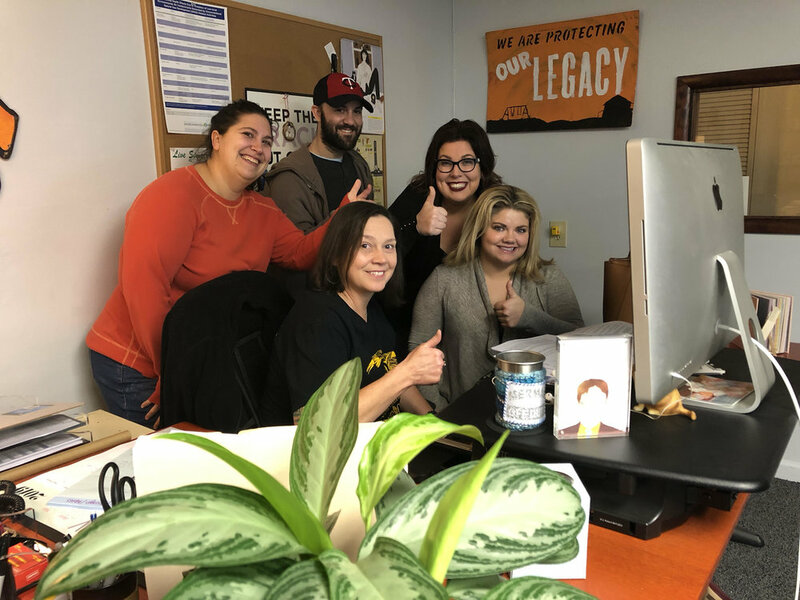 For more information on the Black Lung Disability Trust Fund or on the upcoming advocacy trip, please contact Sarah Martik, our Campaign Coordinator, at smartik@coalfieldjustice.org or 724-229-3550x.1. 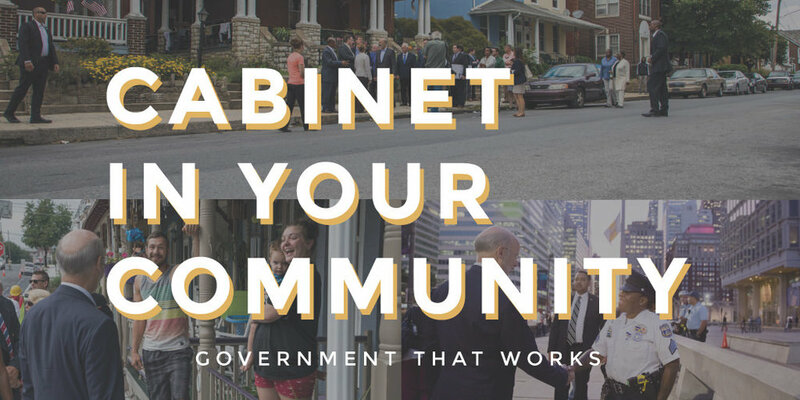 A theater-full of residents from southwest Pennsylvania came together in the morning on Monday, July 30, 2018, for a Cabinet in your Community forum. This is an initiative from the Wolf Administration to ensure that the executive branch officials who are primarily centered in Harrisburg hear from communities across Pennsylvania to learn more about the issues that concern them. Residents are able to ask whatever questions are on their minds, although not all cabinet officials attend each event. At this particular event, the Secretary who received the most questions was the Secretary of the Department of Environmental Protection, Patrick McDonnell, indicating that people in this region are truly concerned about our environment. Most, if not all, questions asked of Secretary McDonnell revolved around fracking, with some people questioning its effects on air pollution through methane leaks and others asking about whether the Secretary is up-to-date on the latest report put out by the Physicians for Social Responsibility detailing the health risks of unconventional oil and gas activity. What was abundantly clear at this forum was the fact that residents want to engage with their public officials, but, more than that, they want their concerns to be sincerely heard and addressed, not explained away and politicized. When future events are scheduled in the area, we will advertise them in our newsletter, so please make sure you keep an eye on the “Upcoming Events” section of that! The Center for Coalfield Justice was honored to host Eliza Griswold, New York Time Best Selling Author and Investigative Journalist, in Washington, PA for the release of her latest book, Amity and Prosperity: One Family and the Fracturing of America. The book centers around the struggle of a family from Washington, PA and the neglect of the government in holding Range Resources accountable for pollution from a gas well. Over 60 people came out to meet Eliza and share their own stories of living in the shalefields while getting their copies of the book signed. The state is launching DEP Connects, a new opportunity from the state regulatory agency to provide communication to residents about DEP programs and to hear from community members across the state. They will hold events in each of the six regional areas across the state. We highly encourage you to sign up to get information on when the DEP will hold an event in your region so you don’t miss any opportunity to be heard.